In the late stages of the war, the Luftwaffe was in desperate need of aircraft to destroy the bomber formations that ravaged <?xml:namespace prefix = st1 ns = "urn:schemas-microsoft-com:office:smarttags" />Germany day in and day out. The Me-262 and Me-163 were only partial solutions. Expensive to build and dangerous to use in turn, these two planes were "too little, too late" to turn the tide in the air. Because of this, the call went out for even more revolutionary weapons that could be made quickly, cheaply and flown by Hitler Youth pilots with next to no training. One solution was the He-162 Salamander [above]. Another was the Fi-103 Reichenberg IV piloted V1 - a weapon designed to be flown either into ships or bombers as a suicide weapon. Well, okay, the pilot was SUPPOSED to bail out, but the chances were slim. Along with these designs, others were put forth. 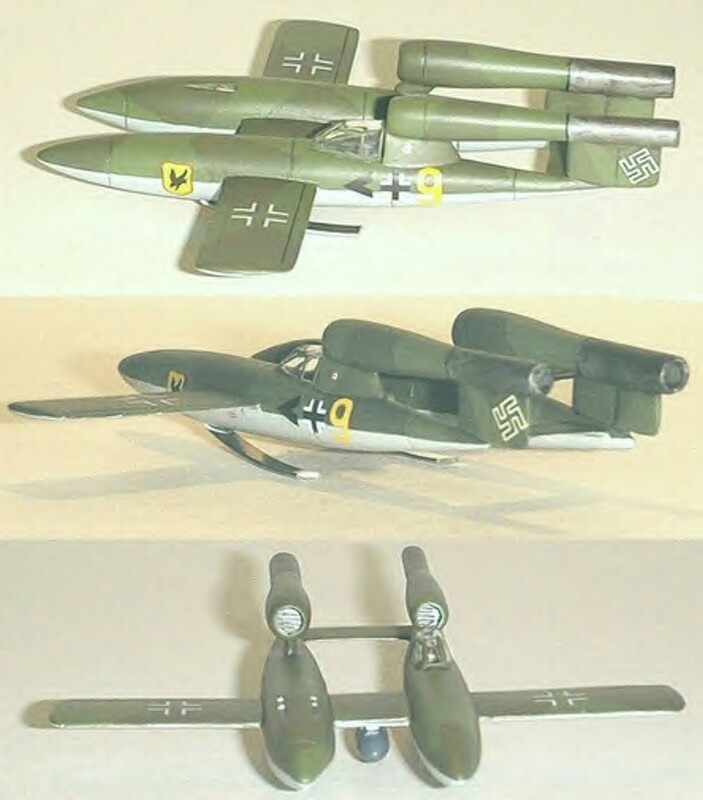 The Miniaturjäger requirement called for a swarm of miniature fighters, smaller than the He-162 Volksjäger (People's fighter) which would literally blacken the sky, and roll the bombers and their escorts back by force of numbers alone. 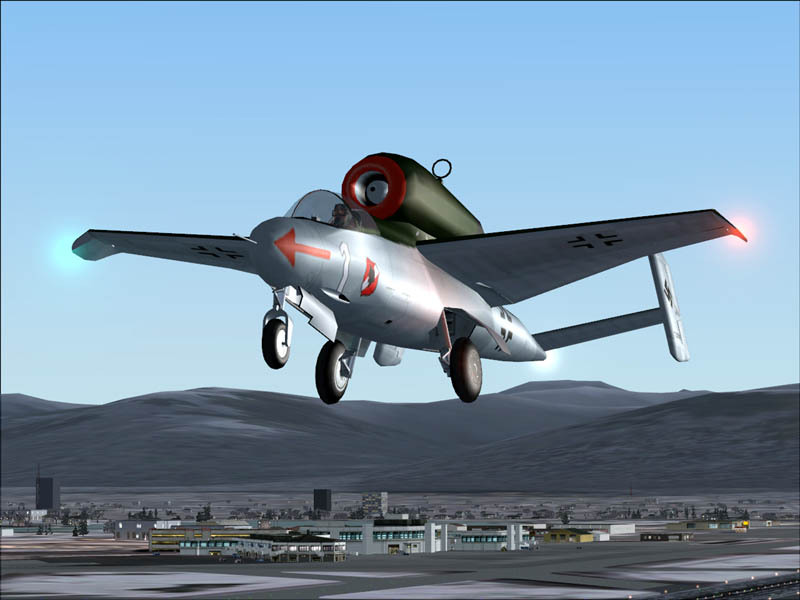 Several proposals were made, including a pulsejet powered He-162 and several other planes that looked similar to the Fi-103 Reichenberg IV. Thus, the RLM issued a request for a proposal from Fieseler to create a Miniaturjäger based on a non-throwaway Reichenberg. Originally, the design was simply to put two guns in place of the Fi-103's warhead. However, this left little room for fuel, and the project was considered too limited. In addition, while the Fi-103 was fairly fast, it didn't have the climb performance needed for interception. However, it was stable, making it a good platform to attack the waves of tanks and troops closing on Germany from both East and West. 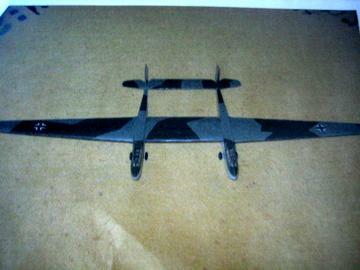 Thus, the design was modified to a twin fuselage, two-engine configuration. It was reasoned that this approach would give not only greater armament and endurance, but also provide some measure of safety due to the twin engines. The Me-328 concept had used twin pulse jets in one of its configurations, although it had been problematic. 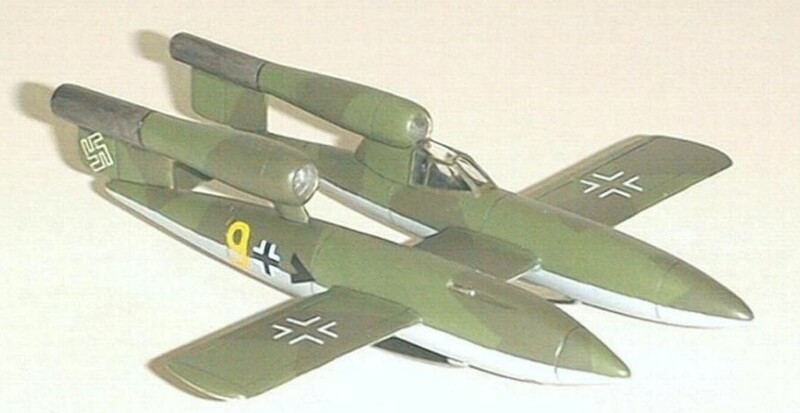 Rather than spend time and money on the Me-328's new design, it was decided to simply fasten two existing airframes together. Parts commonality and simplicity ensured quick production time, and reduced the lead time of the project overall. The center span was strengthened to carry a single 250 kg (550 lb) bomb. The pilot was situated to port, while the starboard fuselage carried fuel and two MG 131 13mm cannons. While too light to attack tanks, the cannons were reasoned to be good enough for use against troops and light vehicles, as well as spotter planes and any seaplanes encountered on coastal operations. Pre-production began in January 1945, and test flights were generally trouble-free. Takeoff was with assistance of a rocket propelled trolley, similar to that used on the early Ar-234 series reconnaissance planes, albeit smaller and cheaper. The Fi-103z was not able to air-launch, however; its bulk and mass proved too much for the He-111 to handle. Landing was on a sprung steel skid fastened by three bolts under each fuselage. There was no throttling the Argus pulse-jet engines, but production models did have a method to adjust the amount of fuel injected on every pulse, thus allowing for some rudimentary throttle control. Landing could be made on one engine, if necessary, and gliding landings with no engines running were common. When the aircraft was approved for production in February 1945, the designation was changed to Fi-203. Manufacture was by unskilled labor, and most components were light metal, with some wood in the wings. Despite its rushed nature, the Fi-203 proved surprisingly robust, and in action was able to sustain a good load of damage before being destroyed. It was a small target for AA gunners, although it was not stealthy in the least. The droning of the pulse jets could not be damped, and conditions in the cramped cockpit were poor. It was said that only the deaf could fly the Fi-203 without going mad, and the constant droning of the jets lead to the unofficial nickname "Die nörglerische Frau" - the "nagging wife." This was considerably less glamorous than its official nickname of "Adlerskralle" - Eagle's Claw, although both namesakes are to be feared. Only the barest essential instruments were provided, and the barest minimum electrical equipment was fitted. There was no ejection seat, and escape was considered nearly impossible. The aircraft were issued primarily to newly formed units, although the commandos who had been originally tasked with employing the suicide Fi-103s were also given a complement. While its climbing performance was poor, the Fi-203 could dive quickly, reaching a speed of 488 mph. This proved to be of great value for making diving attacks on ground convoys or shipping. Employed by very nervy pilots at treetop height, the Fi-203 was difficult to hit and spot from the air, and hard to see from the ground, despite hearing it for some distance. It proved to be remarkably effective in providing close air support to beleaguered troops on Germany's every-shrinking periphery, although many were lost when they were forced to land and couldn't be recovered. 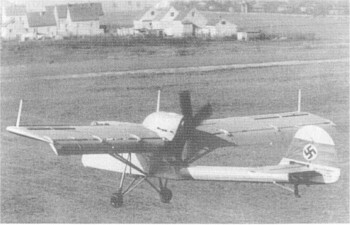 Some attempts were made to transform the Fi-203 into a bomber killer. Various armament schemes were proposed, including the addition of R4M rockets on the center wing, 20mm cannon packs (one on each nose) and the fitting of a battery of Föhn rockets, Natter-like, in each nose. There was even a proposal to fit 50 and 75mm cannons in the un-piloted half, and a two-seat night attacker was proposed, but these proved to be little more than pipe dreams. Overall, the Fi-203 made a slight contribution to the war, although it did prove that Germany was capable of making the best of a bad situation. The model presented here represents an aircraft of II/JG 553, stationed on the 'western front' in April 1945. This unit was tasked with protecting Me-262 bases from ground attacks by American troops. The Fi-203s would launch as the Me-262s returned and would orbit, attacking targets of opportunity. This proved to be a good use for the Fi-203, as it could usually make it back to base, get refueled and be up again in the span of 25 minutes. Only 105 were made, and of these, only 38 saw service. However, they managed to destroy some 110 light vehicles and 12 tanks using their bombs and cannons. The first issue of RLM (German Air Ministry) 8-203 was to DFS ( Deutsche Forschungsanstalt für Segelflug) for a heavy troop and cargo glider with two DFS 230 fuselages joined to a common wing. Project was cancelled. While all Fieseler Fi-203 designations for a twinned V-1 have no official basis in fact as a RLM designation, the concept of using the 203 number for a twin-fuselage Reichenberg aircraft was not uncommon near the end of the war. 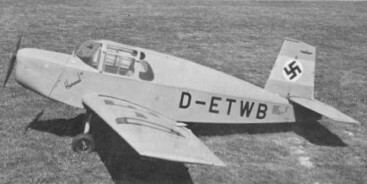 Some refer to this concept as a Reichenberg RZ, or Zwilling (Twinned Aircraft) but also as Reichenberg Reichenberg R-203.